To back up a bit, I got an Atari VCS for Christmas in 1979 (and have no idea where my parents purchased it). I didn’t do much with it until ’81, however (it started out on a black & white TV), but by ’82 I was getting pretty heavily into gaming. I’d go to the local K-Mart, BEST, or Toys “R” Us to check out new cartridges, and I’d see the various retail home computers — Atari, Commodore, and TI — outclassing the VCS with their game demos. 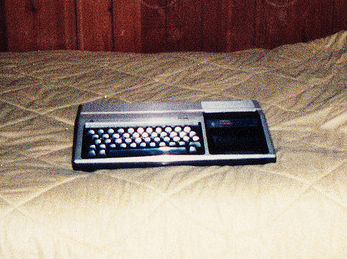 Their keyboards and BASIC and other things that made them “real computers” started to appeal to me in a big way, and I began to urge my parents towards getting me a home computer. My folks came to see the merit in it and it seemed that Christmas would be the time. So, I spent a good bit of time fiddling with the various systems I saw in the aforementioned stores we frequented — Atari, Commodore, and TI — to try and make up my mind about a system to go for. During this time, my mom would take 10-year-old me with her twice a week, more or less, to the local mall, Coliseum Mall in Hampton, VA. I loved that place. My mother was a “housewife” at the time and sewing was a big thing for her. As such, we’d often end up in the Singer sewing machine store where she’d shop for thread or other sewing supplies. Now, oddly, it was around this time that this Singer store started selling computers. This little sewing machine store filled with reams of fabric, pattern kits, and doily-looking things, all of a sudden setup a display along the back wall featuring a Commodore 64 and a Vic-20, an Atari 800, and a TI-99/4A. (As I recall, the Atari 800 was too expensive, but they also sold the Atari 400.) As a regular customer, my mother was friendly with the woman that ran the shop — Sandy somebodyorother — who offered to give us a bit of a deal on the sale if we purchased from them. Christmas was approaching and, so, I spent weeks walking around clutching the BEST catalog and computer pamphlets, furiously trying to decided which system to ask for. I recall a few of the variables I was tossing around at the time. PAC-MAN looked the best on the Atari 8-bit, and I recall thinking it would be impressive to wave in front of my 2600-using friends (we played a lot of 2600 PAC-MAN in those days…oy…). I did not like the look or physical feel of the C64 or VIC-20, so they were right out (interestingly). The shiny, aluminum TI-99/4A looked the most futuristic and “computery,” but Munch-Man was a pretty weak take on PAC-MAN (this was before Atarisoft cranked out a superb PAC-MAN for the TI), though Parsec and its use of the available speech synthesizer was impressive. It’s interesting to note I never even ran across an Apple II or IBM PC, as they were not found at any of the more general retail stores we frequented. And, at that point, they would have been price prohibitive. In the end, I asked for the TI-99/4A and its speech synthesizer module and, on Christmas morning, hooked it all up to the TV in the den for the first time. The Singer connection didn’t just end with the purchase of the computer, however. We learned in early ’83 that a woman from the local TI-99 users group, The Peninsula ’99ers (I think it was called – I became a member), was teaching classes on TI BASIC on the weekends in a back-room of the Singer store at the mall. Her name was Judy North and she and her son were huge TI fans. (Here she is sharing a tip in the Feedback section (page 8) of the November 1986 issue of MICROpendium [PDF].) I signed up and ended up having a lot of fun sending sprites around the screen as part of those small class sessions. Sometimes there were even Krispy Kreme donuts. Sometimes. As months passed, I wanted to do more with BASIC and, so, I sold a pretty shoddy motorbike with which I used to tear up the dirt lane in front of our house for the funds to buy the TI Extended BASIC cartridge ($99). And, for my 11th birthday in the spring of ’83, we purchased more hardware from the Singer store: the TI Peripheral Expansion Box, a disk controller card, a 5.25-inch floppy drive, and a 32K RAM expansion card. By around this time, the computer displays at the Singer store had increased in size and number, taking up perhaps a third of the floor. TI soon pulled the plug on the 99/4A, which was getting trounced by the competition (mainly the VIC-20), and the TI displays disappeared from the store. Over the next few years, however, more systems and peripherals went on display there. One of particular note that I recall was the Sanyo MBC-550, a loose PC clone that had some interesting graphics hardware. (It had its own version of Time Bandit.) That Singer store is the only place I’ve ever encountered one in person. In 1984, what with TI out of the home computer market, I put an ad in the local newspaper, The Daily Press (interesting story, there…), and sold the TI system, moving on to the newly-released Apple //c. I have since, however, reacquired a full TI setup and enjoy playing around with it from time to time. 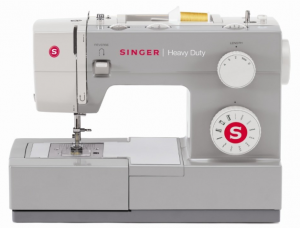 In prepping for this post, I carried out a number of searches to try and find other accounts of computers being sold through Singer stores — and came up empty-handed. I did discover that in the the ’60s Singer acquired Packard Bell, and later acquired a minicomputer corporation, but I found no mention whatsoever of computers being sold in their retail stores, either as part of a corporate history or by way of a user account. And that vexes me. I’d love to hear if anyone else out there ever saw a computer display in a Singer store in the ’80s, anywhere in the U.S, or if anyone happens to recall that Hampton, VA store that I frequented 30 years ago. Surely I’m not the only one who got their first computer from so unlikely a vendor. This entry was posted in TI-99. Bookmark the permalink. When I bought my FIRST Home Computer back in 1983, like millions of other users out there it was a Texas Instruments – TI 99/4A. Like many other users out there I learned how to program and use it for technical office processes like word processing (TI Writer) & making and using spreadsheets (Microsoft Multiplan). Like many a ‘first love’ that TI 99/4A computer was never completely remembered or wholly forgotten!! I packed my TI 99/4A away long ago, but recently ran across Cory Burr’s Win99/4A, an EXCELLENT simulator of the TI 99/4A with full speech capabilities, sound capabilities, and very good module compatibility that runs on PCs running “Windows”. I can now get back into writing programs in Extended Basic, using the Mini Memory Cartridge again, and using the good educational modules for my nieces, nephews, and other children; all this on my PC. Just go to on the http address below. It will take you directly to where the file is located and can be downloaded. Over 200 Cartridges (Modules) in file format are available for download for Win994a. Just go to on the http address below. It will take you directly to where the files are located and can be downloaded. Download and uncompress the cartridge(s) item. This may take a little while since the file is roughly 27meg. Uncompress the contents of this file into the “carts” directory under the “Win994a” folder of your hard disk. This will make all 200+ carts available to Win994a next time you start it up. Enjoy. Win994a is a TI-99/4A simulator written by Cory Burr that installs and runs in the Windows environment. Win994a is not a perfectly accurate emulation of the TI-99/4a; and it was never intended to be. The author decided not to implement certain aspects of the TI-99/4a either because they are rarely used or were considered of “no-value-added”. The author vigorously apologizes to those users who will miss a favorite peripheral or item of functionality. The list below details the various functionality provided by the Win994a Simulator. Boots and runs all console ROM and GROM based functions including console BASIC. CRU bits for the keyboard are implemented; some CRU bits for the Disk Controller and RS232 Interface are implemented. TMS9918a video chip functionality is implemented. TMS9919 sound chip functionality is implemented. TMS5520 speech synthesizer chip is implemented. Full floppy disk and disk controller functionality. Full cassette tape functionality for CS1. PIO and RS232 ports are supported, but using a different method than the original TI99/4a. Support for one joystick input (using numeric keypad). Runs over 200 cartridges correctly. Cartridges that depend on non-implemented CRU bits or non-documented video chip operation will fail. All TMS9940 CPU instructions are implemented. CPU clock ticks are accumulated for both instructions and fast/slow memory accesses. When enough clock ticks have been accumulated for 1/16 of a second real elapsed time, Win994a checks the high precision clock (available in the PentiumPro and above processors) and gives up enough of the time slice so that accurate running time is maintained. Console based cassette tape functions for CS1 supported. Console ROM and multiple console GROM functionality implemented. Multiple peripheral based ROMs supported. Multiple cartridge based ROMs, GROMs, and RAM supported. TMS9918a: Uses DirectX for all operations. Video modes GRAPHICS, TEXT, MULTICOLOR, BITMAP, BITMAP-TEXT, and BITMAP-MULTICOLOR are implemented. Sprites, sprite coincidence, screen blanking, and vertical interrupt operations are implemented. TMS9919: Uses DirectSound for all operations. All three voices and noise channel supported. TMS5520: Speech synthesizer functions implemented. Disk Controller and three floppy drives fully supported. PIO and RS232 ports are supported, but using a different method than the original TI99/4a. PIO/1, PIO/2, RS232/1, RS232/2, RS232/3, and RS232/4 provide six separate pathways for making printouts through Window’s print system. They do not provide input/output capabilities with the PC’s actual hardware ports. Support for one joystick input (using the keyboard numeric keypad) is implemented. Using RXB [Rich Extended Basic] and FUNLWEB [Funnel Web] together is as close as one can get to having a “DOS” like operating system for the TI99/4A Computer along with its Emulators & Simulators*. 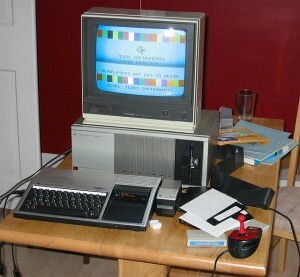 No longer having a physical TI99/4A computer set up, one can imagine this must be the same situation for those users that have the ability to use this physical set up of their computer. Again this example just shows anyone that is willing to investigate how the potential of this computer was not developed by its parent company in a corporate decision to not have this consumer computer compete with its business computer. RXB was developed by Richard Gilbertson and FUNLWEB was developed by Tony & Will McGovern, these two groups of gentlemen were thousands of miles apart and probably developed their programs out of a necessity because the ‘operating system’ that was offered by the parent computer company was so inferior. Sometimes the small group can really out perform the big company. I used to watch my mum & grandma knitting, the patterns they follow always reminded me of some sort of programming language. No idea why a sewing machine shop would sell computers, but there’s always been a strange link between computing and sewing so it’s not totally absurd I suppose. The first “programmable” device was a weaving loom after all. Jim Peterson of Tigercub fame distributed a lot of “quilting” graphics demos. on my otherwise not really there yet site. My first home computer was a Vic-20 from kmart, then a c-128 from Target. The oddest store I ever saw along that line was a combined Radio Shack/furniture store. It was literally split right down the middle with a narrow aisle between. The right side sold Radio Shack products and the left side sold furniture. I saw one customer span stores by sitting on a bed while looking at a computer. I wonder what the reason was behind such a strange setup. I would love to see a picture of this. I have a small model and would like to see if they are indeed a Singer System 10 (or other Singer, if there was one).